Located at 8364 Bay Street, Sodus Point, New York on the east side of the Sodus Point Firehall which is on the south side of the road. 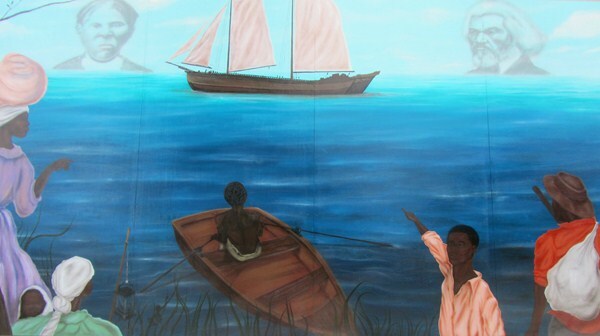 This mural depicts a scene of the Underground Railroad. From stories passed down there were several safe houses in this area that were used to harbor “Freedom Seekers”. These included the old Cohn Farm and the old Sodus Fruit Farm and what is now Maxwell Creek B & B and Silver Waters B & B. Sometimes a schooner, out of the old Sodus Point ore dock, would pick up slaves on its way to Canada. 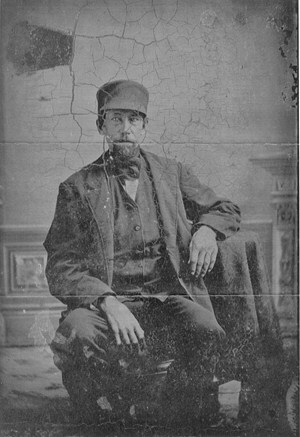 Captain George Garlock ( 1832 – 1906 ) ran a freight schooner (sail only ) out of Sodus Point, NY named “Free Trader“ in the mid-1800’s. It was a two masted, one deck, 46 ton, squared sterned, carved head schooner with a crew of 4. He would take a load of lumber or ore from Sodus Point to go across to Canada. The schooner would leave anytime day or night depending on the weather. He would sometimes be going on Lake Ontario west and then north toward Canada to Brighton, Ontario (a small town pretty much straight across the lake from Rochester). If he saw a small rowboat off shore with people on it, he would stop and pick them up. These fugitive slaves would come from the Cohn Farm and Old Sodus Fruit Farm ( Old Swales Farm ) and gather at a bluff overlooking Lake Ontario now known as “Freedom Hill”. If daytime they would see the schooner coming and at night time they used a lantern to get its attention. They would then go out in a small boat. These African-American people would then be “stowed away” on board until reaching Canada. Captain Garlock would then return with a load of grain to one of the local gristmills, or whatever he was bringing back from Canada. Also pictured in the mural are the images of Frederick Douglass (Rochester, NY) and Harriet Tubman (Auburn, NY) who were well known area African-American abolitionists. 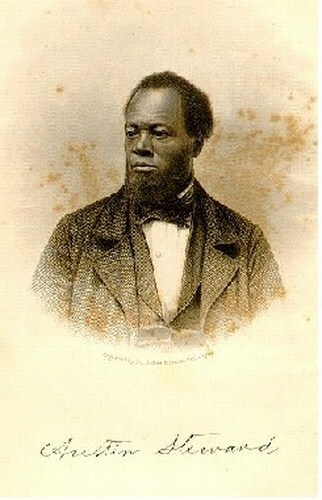 Austin Steward was a slave who spent a year in Sodus Point and later would become a free man and well known author and abolitionist. In his book entitled “Twenty-Two Years A Slave and Forty Years a Freeman”, he devotes a chapter about his experiences in Sodus Point. He wrote this about the Underground Railroad: “ Is not the necessity of an “under ground railroad,” a disgrace to the laws of any country? Certainly it is; yet I thank God, that it does afford a means of escape to many, and I pray that the blessings of Heaven may ever rest upon those who willingly superintend its interests”.